What better way to ring in a new year than a review that only tangentially has anything to do with it? Based on the Broadway musical that is itself a dramatization of the 1960’s singing group The Supremes, ‘Dreamgirls’ opens with proxies for Diana Ross, Florence Ballard and Mary Wilson in the middle of an amateur talent contest. Here called Deena, Effie and Lorrell, it’s after losing this contest that the girls are discovered by Curtis Taylor Jr, who signs them all up as background singers for James “Thunder” Early. Under the name “The Dreamettes” the lovely trio move up the ladder of fame, only to find the path filled with more adversity and conflict than they could’ve imagined. Said conflict feels natural engaging the whole way through, with moments of levity and characterization interspersed so as to keep it from feeling to heavy handed. On that note, one thing I appreciate is how the racial politics of the era is more of a side thing. I’m all for keeping people in the know of tough things were/are for African-Americans, but if there’s one thing I find makes other historical dramatizations a bit samey, it’s the fact that the race element so utterly dominates the story that the films would have little left to engage the audience with beyond that aspect. 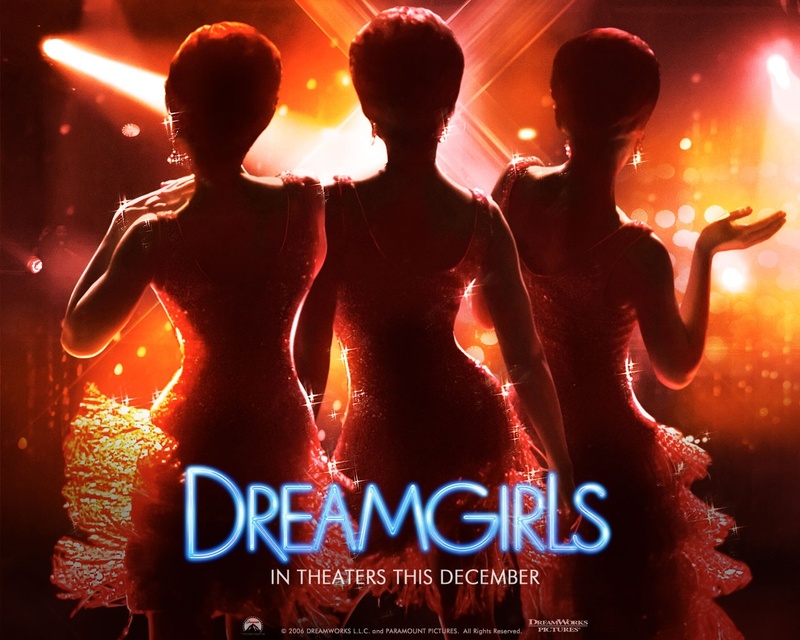 ‘Dreamgirls’, on the other hand, has a story that I find investing all it’s own. Though I all honesty, that point is kind of a complicated one, so I’ll touch on it again I the characters section. The pacing here is practically perfect. Every scene, every line of dialogue, serves a purpose, and yet it doesn’t feel at all rushed. Just the right amount of time is spent on every development, and the dynamics shift at exactly the right time. Everybody’s favorite Beyoncé plays Deena Jones, and I have it secondhand that she really manages to capture a lot of Diana Ross’ mannerisms. Thankfully, this all takes place before 1978, so she’s not obligated to look utterly busted and miserable for ‘The Wiz’. On repeated viewings of the movie, I find it harder to determine who out of Deena and Effie is the “true” protagonist. I mean, Jennifer Hudson was awarded for ‘Best Supporting Actress’, but both women have character arcs that run parallel to each other and equal presence overall. I actually find this a good thing, as it means I find both characters equally engaging, and am never wishing that one would have less prominence so I could get back to the other. With that said, absolutely everyone agrees that Jennifer Hudson stole the show, completely and utterly. And while I think it’s a tiny bit unfair to place her on a pedestal above the rest of the cast, I’m not really gonna argue this point. Her performance (and especially her singing) is what you will come out of this movie remembering. Her story is the most gripping and heartbreaking and she is the extra push that transcends this movie from “good” to “amazing”. Anika Noni Rose is the third wheel Lorrell, and while it’s easy to say that she didn’t do too much, she serves more as the voice of reason and relative innocence. Along with Keith Robinson’s C.C, she is begrudgingly complacent with the industry, easily getting a better deal out of it then those around her. Transitioning to an earlier point, Jamie Foxx’s Curtis is where the film’s unique relationship with race takes place. Curtis, out of all the main characters, is the only one who isn’t invested in the music making process on an emotional level. All he cares about is getting the widest audience possible, and throughout the film his every decision reflects that. He is also, for all intents and purposes, the antagonist, with Foxx’s natural charm being all that keeps him from “complete irredeemable monster” territory. He ruins the people around him (people who are only ever invested I making the sound they want) by trying to transcend race barriers and appeal to white folks. I can’t help but find this intriguing in a genre where “transcend racial barriers” is usually the M.O of the protagonist. By extension, the audience at least partially disassociates with the idea of the girls’ rise in popularity being a good thing. Not because we don’t want them to succeed, but because success means the destruction of their personal lives for reasons that are pretty stupid at face value. For once, we don’t want the characters to do things for the sake of overcoming the race barrier, as they don’t actually gain anything worthwhile in doing so. As an example of this, Eddie Murphy is both entertaining and tragic as Jimmy Early. Out of all the characters he’s the most obviously passionate about the music, and yet is constantly pigeonholed by Curtis (and by extension the industry at large) to the point where he can’t find any enjoyment in what he loves does if he wants cross-appeal. While he is no saint, one can’t help but sympathize for him as he goes from top of the world to little more than a footstool for the girls. Overall, the cast is brilliant, and to change a single casting choice in this film would be to kill quite a chunk of it. I tend to be a sucker for musicals, though it’s rare that I have so much unequivocal love for every number as I do here. Every song is brilliant, and everyone’s singing is perfect. The songs are all integrated well into the story, in that (with two exceptions) they are all diegetic for the characters. While this has the potential to make the non-diegetic numbers distracting, I don’t think anyone is going to complain about having to watch this scene. If I had to find one thing to complain about, it’s that the editing can feel a bit off at times. One or two scenes have a lot of cuts in quick succession, which can be a bit distracting, but it’s really no big deal. That aside, I can’t fault the film visually. Some of it is downright outstanding. There’s enough in ‘Dreamgirls’ to appreciate that I think just about anyone can enjoy it, no matter their taste in movies. My enjoyment hasn’t dimmed even slightly in the years since it’s release. Not only is it well made, but it’s also timeless, and it’s another one that I recommend absolutely everyone check it out at least once. Posted on January 5, 2015, in Movie Reviews, Other Movies. Bookmark the permalink. Leave a comment.